"A brilliant pianist whose technique is balanced by a fire of the imagination." His piano playing is filled with the utmost of a distinctive sound quality - it is genuinely inspired and charismatically inspiring. The meaningful sense of his interpretations translates his natural musicianship’s intuitive power combined with a rare and profound thoughtfulness coated in masterful craftsmanship. "His complex and varied program showcased a wide ranging array of skills from soloist to collaborator in our series"
- Antonio Damasio - Neuroscientist, Director of the Brain and Creativity Institute of the University of Southern California, event series curator. American pianist Carlos Gardels has performed throughout the United States, Europe, and Asia, and has established a multi-faceted career as a soloist, collaborative artist, teacher, and writer. 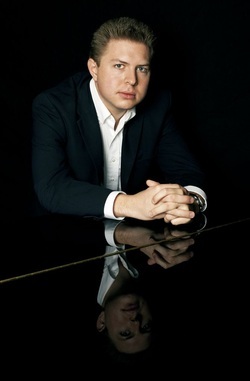 A native of Los Angeles, Mr. Gardels made his professional debut at age fifteen as a soloist in the Rachmaninoff Third Piano Concerto with the Pasadena Youth Orchestra under the direction of Robert Allen Gross in the Wilshire Ebell Theatre, and made his debut appearance in Carnegie Recital Hall in 2015. He has performed at such festivals as the Alion Baltic Festival in Estonia, and the International Keyboard Institute and Festival in New York City. In the Southern California area he has soloed with the Beach Cities Symphony, Young Artist's Concert Orchestra, Gold Coast Chamber Orchestra, and performed recitals at the Richard Nixon Library, USC's Dornsife Brain and Creativity Institute, Pasadena Presbyterian Church's Music at Noon series, among others. He has received awards from the National Society of Arts and Letters, the Young Musician's Foundation, and the American Protege International Piano Competition. ​Mr. Gardels completed his undergraduate studies at the Manhattan School of Music under Jeffrey Cohen, and received a Master's Degree at Indiana University Bloomington where he worked with Emile Naoumoff. Other mentors have included David Dubal, Cyprien Katsaris, Vladimir Feltsman, John Perry and Neil Stannard. An esteemed and versatile teacher, Mr. Gardels is an active member of the Music Teacher's Association of California (MTAC), and runs a private teaching studio in the Los Angeles area where his students of all ages have garnered awards and honors. He frequently serves as an evaluator at competitions and festivals. In 2014 he was a visiting faculty member at the FaceArt Academy of Music in Shanghai. Additionally, he is on the music faculty of Citrus College in Glendora, where he has teaches courses in class and applied piano, music appreciation, and musicianship. As a composer, his 2017 piece "Late October" was a winner in the MTAC Composers Today competition. His articles on music and pedagogy have been featured in The Huffington Post, Clavier, and the California Music Teacher.